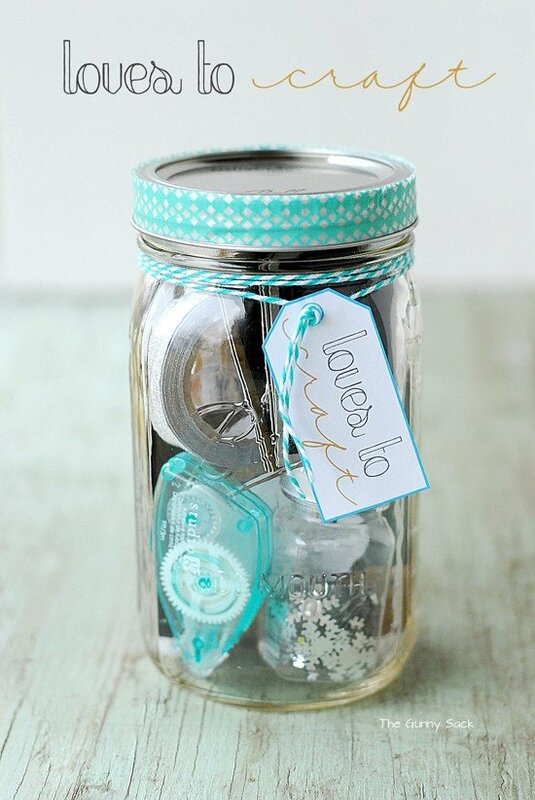 Before I get started on today’s blog post, I want to talk to you about gifts in a jar. If you are a long time reader of The Gunny Sack, you know that I am a huge fan of mason jar gifts. I shared my very first gift in a jar post called Everything In A Jar way back in October of 2011!! Since that time I’ve shared numerous mason jar gift ideas and I’ve seen countless other bloggers run with the idea, sharing their own versions. Nowadays, I mainly share recipes, as you know, but I have so many mason jars ideas in me and I really want to keep sharing them on my blog. 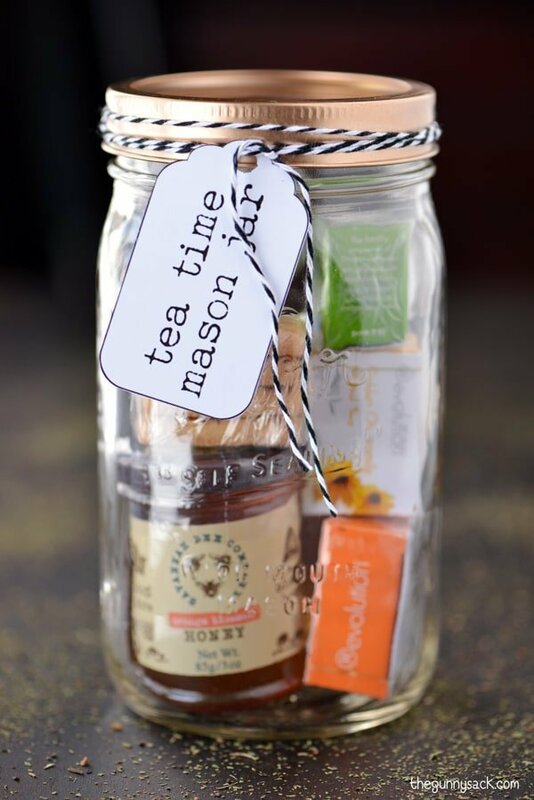 Since I still get a ton of visitor to my older mason jar blog posts, so I know that readers are still interested these fun homemade gifts as well. All the “experts” say that you are supposed to choose a very specific niche for your blog and stick to it, but I’ve decided not to listen to the experts, this time, follow my passion and share a few mason jar gifts while continuing to share delicious recipes. I hope that you find these gifts in a jar as enjoyable as I do! 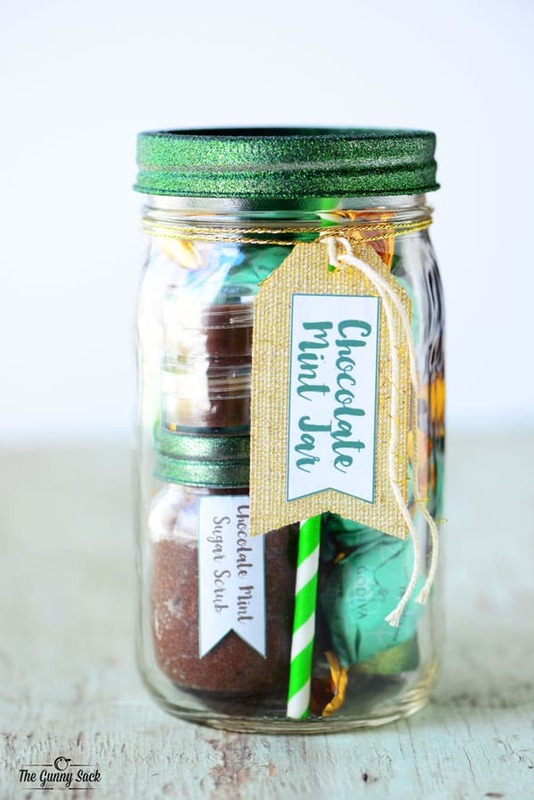 This gift in a jar is perfect for the chocolate mint lovers in your life. It is a gift that you can give to the special women in your life from girlfriends and sisters to mom’s and teachers. 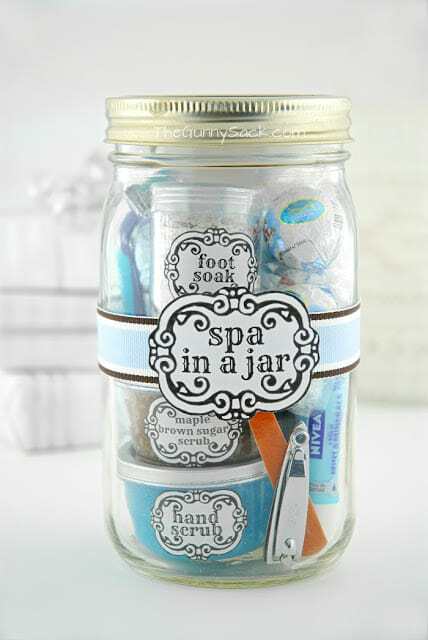 They would be perfect for a spa party or party favors at a bridal shower. Disclaimer: Please note that some of the links in this post are affiliate links to the items I used to make this mason jar. There is no additional cost to you, but I may earn a small commission if you purchase through those links. Thank you for your support! 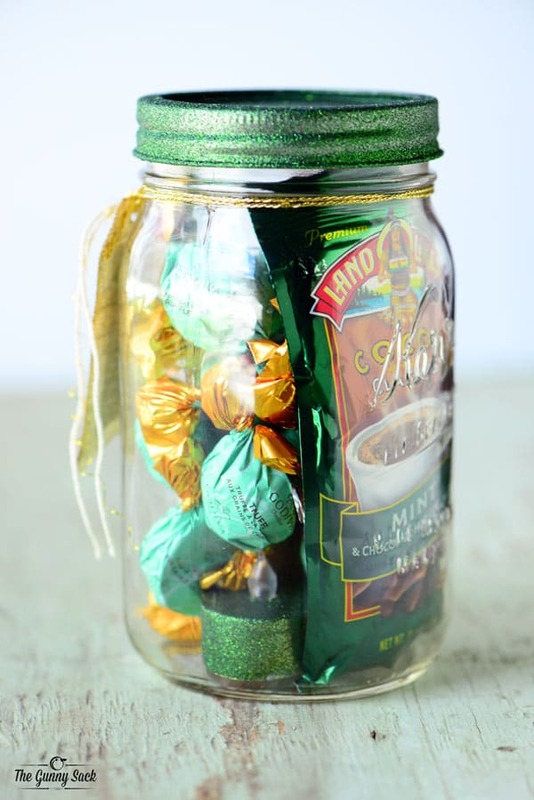 I spray painted the lids of these mini mason jars using Krylon Lucky Green Glitter Blast spray paint and filled them with Chocolate Mint Sugar Scrub. 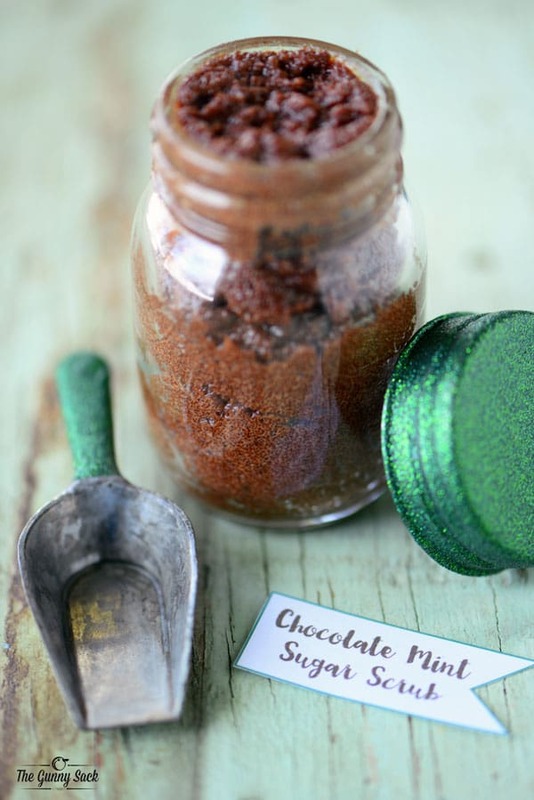 (You can find the Chocolate Mint Sugar Scrub recipe here.) I also added a small metal candy scoop with a spray painted handle. Green Glitter Candle: I taped off the “flame” part of a flameless tealight candle and spray painted the plastic using the same glitter spray paint. 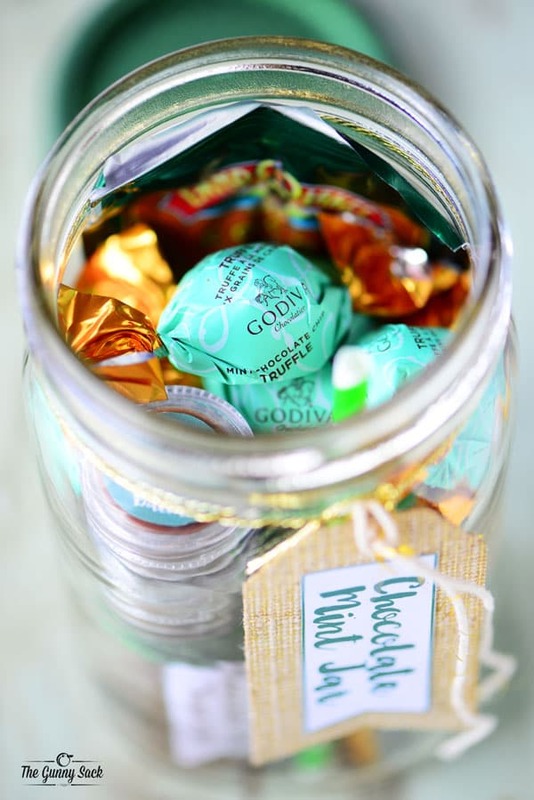 Chocolates: These Godiva Mint Chocolate Chip Truffles are perfect for these jars. 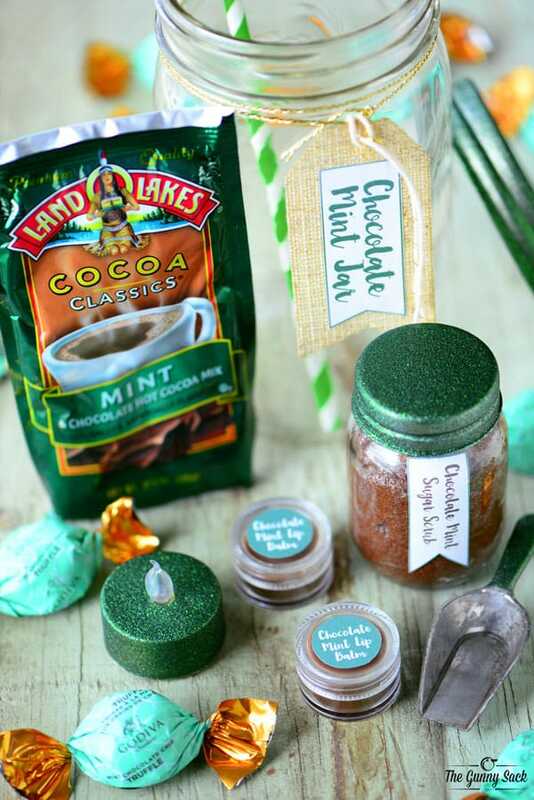 Hot Chocolate: I used these individual envelopes of Land-O-Lakes Hot Cocoa Mix. Straw: Add one of these Green Striped Paper Straws for fun. Fit everything into the mason jar as if you are putting together a puzzle. Turn the labels to face the outside of the jar so that when you turn the jar around, you can see everything that is inside. Here is a look at the backside of the jar. It is much more appealing to see the front label of the hot chocolate mix than it would be to see the backside of the label. Finally, add the green glittering lid and attach the label with gold string. 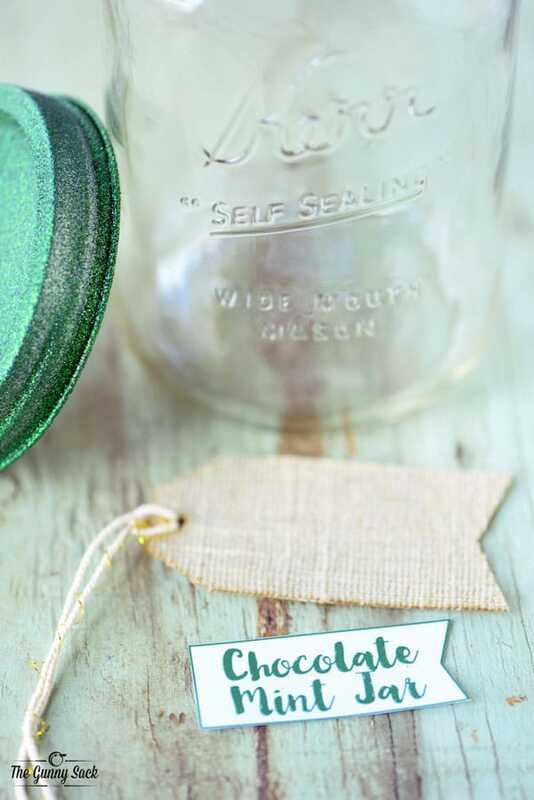 This Chocolate Mint Mason Jar is full of pampering spa items and sweet treats. 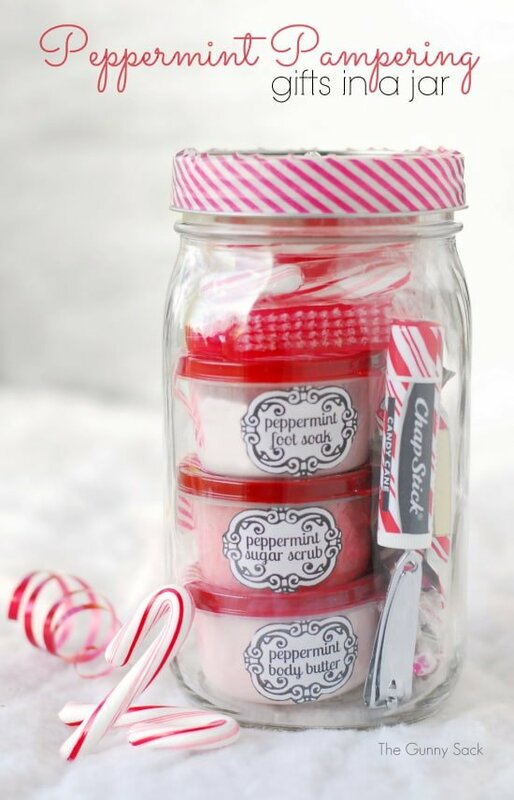 A gift in a jar is a homemade gift idea that is perfect for any occasion! Thank-you. 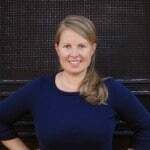 I like recipes, but I LOVE your mason jar ideas!